Trading corrections can be exciting, fun, horrifying, profitable and devastating all at the same time. 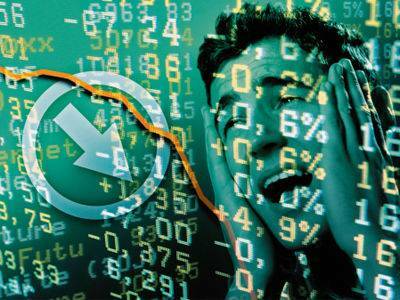 No time in the market is more emotional, volatile and unpredictable. All what worked previously seemingly no longer applies. It is easy to get caught up in the new emotion in the market and traders often find that trades go against them and it impacts their psyche which often leads to poor decision making in the moment. Most often this is driven by decision to overtrade, overexposed positions taken on, and a loss of the larger picture. It is true that nobody knows where a correction will end. As traders the best we can do is identify levels, watch the tape’s reaction against levels and then enter trades based on a risk/reward setting that we view as favorable. Risk/reward does not mean a guaranteed winner, it means identifying odds that are in your favor. That is an important distinction and directly relates to sizing and confidence in a trade and, ultimately, the impact on your P&L. As you know my process structurally is one that acknowledges that I don’t know every twist and turn a market makes, hence I don’t trade to maximize the profit on what might happen, but take profits on positions when they actually happen. In most cases that profit is then something I can count on, i.e., the $VIX short positions this week. I knew they could turn greater profits, but my process told me to lock in profits. Yes I left some money on the table, but most people who didn’t lock in the profits saw their profits evaporate again on renewed selling pressure. Hence, whether in a full correction mode, or in calmer market environments, I lock in profits when they present themselves. It is a style that suits me and recognizes that markets move in a direction counter to my opinion all the time.. I was asked about stops in the past couple of days. I usually use stops in a regular trading environment, but, and this may surprise many, I don’t really like to use stops in this corrective environment at this late stage. 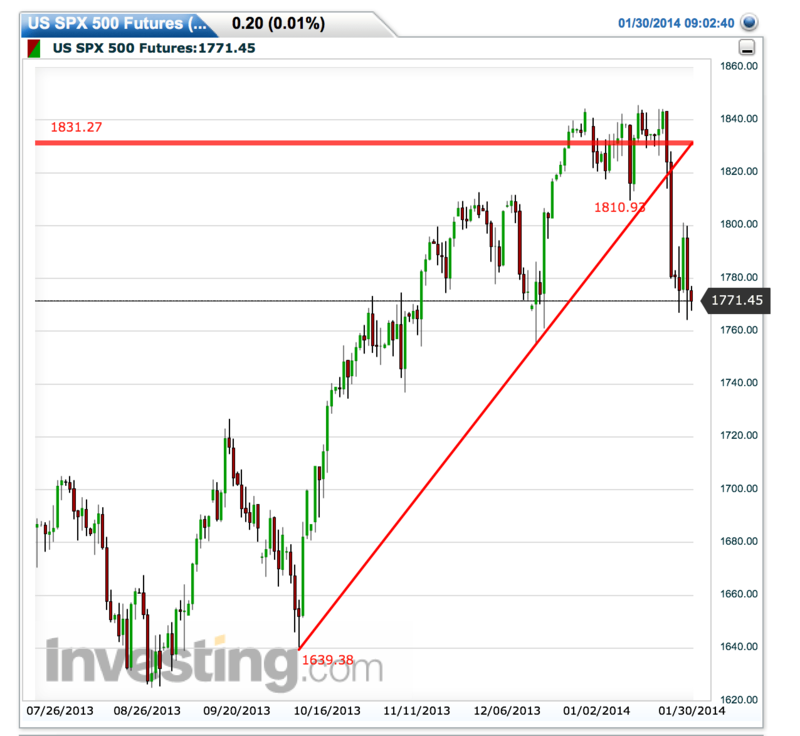 By that mean a market that is increasingly showing probabilities of turning. I can’t know precisely the hour or the day, but I can read the technical signals. What happens at these late stages is that markets moves erratic and will take out any tight stops. You could have a great entry, but you get wiped out of your position because of some quick downdraft. What’s the evidence right now? Blocking out all the news and noise the chart shows that we’ve entered a corrective period that is really not much different than what we have seen in the past few months. If anything, it looks more like the June correction with its quick move below the 50MA and the full stochastic shows a point that is commensurate with a likely bounce area. So I’m trading this pattern for the moment. Of course you don’t want to be completely wrong and find yourself in a brutally negative position, but that’s why I use scaling. I never, ever, enter with a big position. My opinions do not matter and when markets are in a corrective mode and move quick I allow for wide enough scales, I look for bottoming candles and panic sell stop flushes which i know to improve the odds for a bounce. I also then scale into call positions that give me the luxury of time, meaning they are a bit further out in expiry. As you know from my account strategy process the sizing between option trades and futures trades varies significantly. 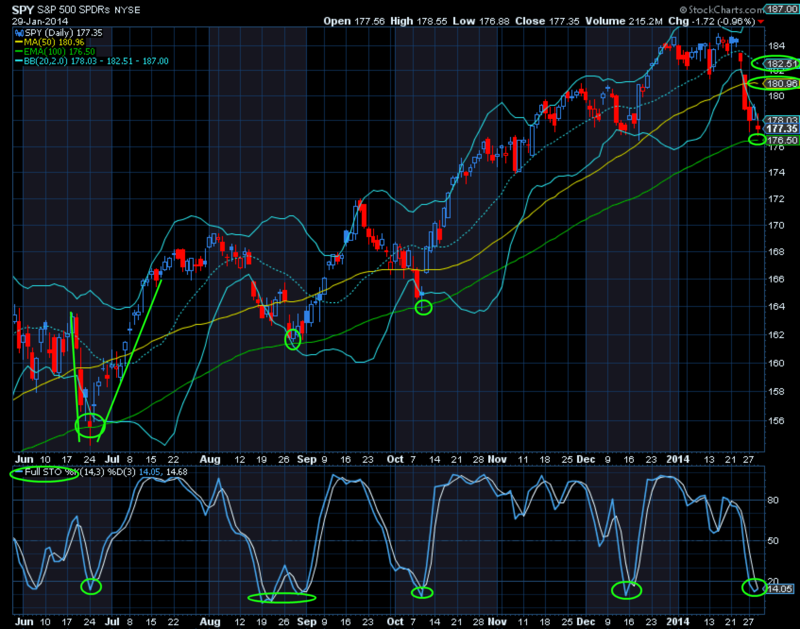 But when the invariable bounce comes I am then properly positioned to take advantage of the volatility to the upside. Know that if you overexpose yourself you will get stressed, and that will invariably impact your trading psychology. With option trades never enter a position that you don’t mind losing if it goes completely against you. Many people play spreads that limits their risk which is a fine strategy. It also minimizes your potential return. I’m an aggressive trader when it comes to options and I place small directional bets. My lottery plays are sized that they will never hurt me or my portfolio. My positional option plays are of higher exposure, but because of my sizing approach they will not kill my portfolio. I can’t stress the importance of this enough. As I know some clients don’t have future accounts yet and are trading options only: In corrections options can provide enormous returns, but they degrade super fast if the direction goes against you. We are in global markets and the overnight action is unpredictable especially in a corrective phase, so the chances for large gaps are much higher. If you hold positions overnight that’s great if they gap in your favor but devastating if they gap against you. With futures I can act at anytime and hence you have seen me being able to take advantage of the Turkey central bank driven ramp the other night, AND I can be a bit more flexible about staying in a position or take advantage of overnight moves/dislocations. Hence I keep position this point: Have access to both to complete your tool kit. As you know I have been trading this move from the long side here and so far this has worked well, although I have a few call positions under water at the moment, I’ve had enough large profitable trades this week to more than cover the remaining exposure. We have yet to see a sizable bounce but I’m in the camp that it is coming, albeit possibly from a bit lower level, but odds favor a rather sizable move, hence this is what I am positioning for. 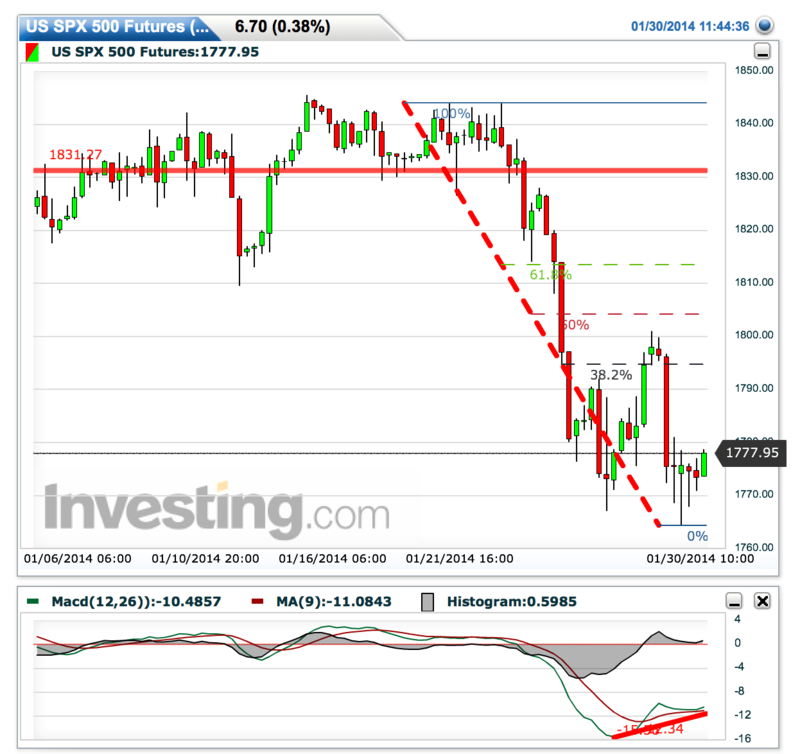 $ES: We made a slightly lower low yesterday, but closed above the previous low. 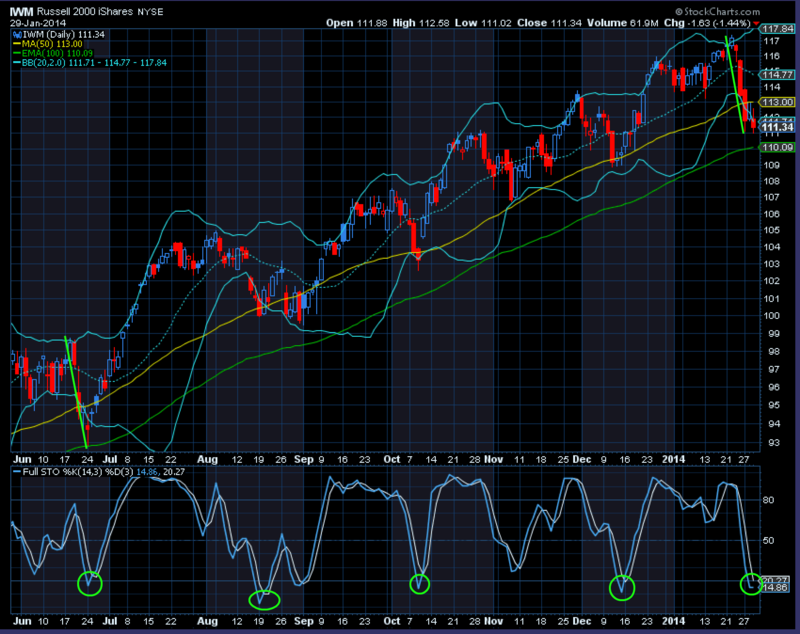 The 5 hour MACD is is showing a positive divergence. 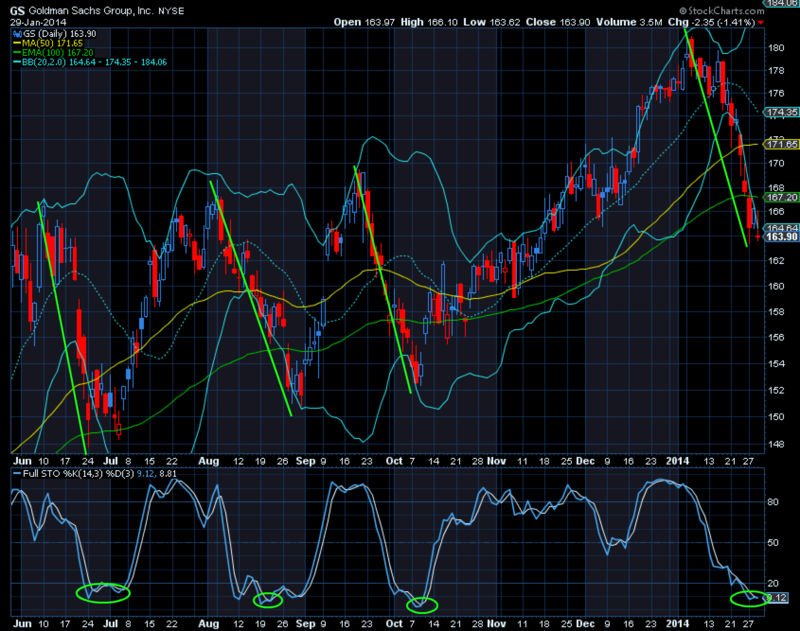 $IWM: The larger indices are showing oversold conditions and stochastics are at levels similar to recent previous bottoms. Now all this is conjecture of course, but this is my technical view at the moment. No doubt today may be another shaky and choppy day and frankly for underwater call positions we want to see an aggressive bounce action sooner rather than later. 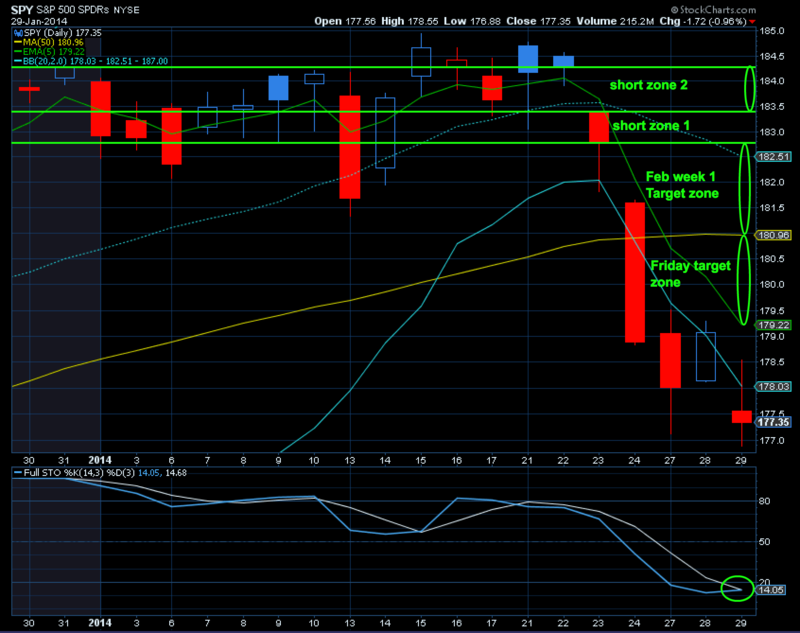 As it is we are now entering mark-up time and we have a $4.75B POMO tomorrow, both are market supportive. We shall see what they come up with, but my guess is performance pressure will win the day. $GS: For all the scary down move action in $GS it really hasn’t done anything different than what it has done previously. So in my view a bounce there is imminent, as a result I’m aiming to establish a February week 1 call position there as well. But curious if this analog is still receiving a lot of attention…Or is now the time to revisit it ? well a day like today makes one wonder..